Detroit and Flint—both with large black populations—have high unemployment rates and should qualify for exemptions. But they don’t because they’re part of larger counties with low unemployment rates. That’s a tough break, isn’t it? But here’s the odd thing. 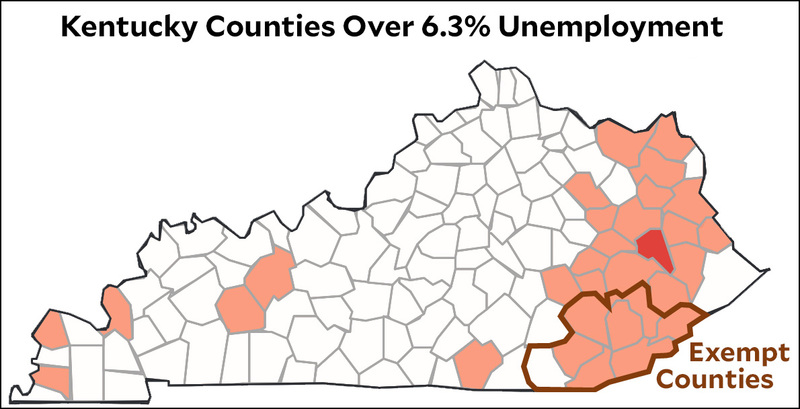 The official excuse for this is that unemployment rates are consistently available at the county level but not at the city level. That’s what the feds give them, so that’s what they have to work with. Except it’s not true. In Kentucky, they may have exempted a bunch of folks from coal country who happen to be white, but that’s sort of a misdemeanor as these things go. For the rest of the state, they exempted people from the work requirement if they already qualify for exemption from the SNAP work requirement. That’s pretty easy, after all. States already have the SNAP exemptions figured out, so there’s zero work involved in using that. But here’s the thing: SNAP exemptions are based on both cities and counties as the regions of interest. In Michigan, for example, both Detroit and Flint are designated as “Labor Surplus Areas” and therefore qualify for exemptions. So Michigan latched onto Kentucky’s idea of exemption by county but decided not to follow their lead in using SNAP criteria for most of the state. Why? It’s a mystery. But the bottom line is this: Michigan passed up on the easiest exemption criteria, instead making up a brand new one that just happens to exclude the biggest black populations in the state. Ohio is going down the same road, and a bunch of other red states are queued up behind them. Is this just a big coincidence? It hardly seems likely, does it? POSTSCRIPT: It’s worth noting the political genius of this, which goes well beyond favoring whites over blacks. It’s also guaranteed to provoke a lot of blowback—like this post, for example. Republicans can then sigh and throw up their hands: You liberals have to make everything about race, don’t you? We just wanted to encourage able-bodied welfare recipients to find jobs. They don’t mention that they did this deliberately and were probably hoping for exactly this blowback since it does nothing but help them with their base, which thinks the exact same thing. The alternative is that they’re all so innocent that they didn’t even notice the racial impact of their handiwork. I leave it to you to decide how likely that is.